ISLAMABAD: The Senate on Friday unanimously passed a resolution commending the role of Pakistani women in the nation building. The resolution moved by Nuzhat Sadiq on the occasion of International Women Day, demanded that concretes steps should be taken for women empowerment. In his remarks on the occasion, Chairman Senate Sadiq Sanjrani appreciated the contributions of Pakistani women in different fields including politics and sports. He said such an environment should be created that enables our women to move forward without any impediment. The Senate was informed on Friday that no unannounced gas load-shedding is being carried out in any part of the country. Minister for Petroleum Ghulam Sarwar Khan told the House during Question Hour, that efforts are afoot to remove system constraints in order to address the issue of low gas pressure. He said Sui Northern Gas Pipeline Limited has started injection of RLNG which has mitigated demand supply gap of natural gas to a great extent. He said the gas distribution company has also arranged a number of LNG cargos which will further improve the situation. He said efforts are also being made to check gas theft. He said forty-eight billion rupees have been released for establishment of twenty-six LPG air mix plants in Balochistan province to meet the gas demand there. Minister for Religious Affairs Noor-ul-Haq Qadri told the House that a proposal has been prepared to promote dialogue between followers of different religions in order to achieve the goal of interfaith harmony. He said under this proposal our religious scholars will visit Churches and Gurdwaras whilst the followers of other religions will visit mosques to promote interaction amongst them and remove misunderstandings. He said Paigham-e-Pakistan document carrying signatures of nine hundred scholars belonging to all schools of thought has also been launched in which suicide attacks have been declared ‘Haraam’. He said this document also lays great emphasis on interfaith and intersect harmony. He said the present government is following the model of Madina State and will formulate laws to run the affairs of the country as per the Islamic injections. Responding to a question, The Minister for Religious Affairs said that Ahmadis are minorities and they will be treated as per the provisions of the constitution. Minister for Power Omer Ayub told the House that nuclear energy will remain an important component of our energy mix. He said we are rapidly building up the nuclear energy and have also prepared a plan to make more investments in this source. We currently are producing 1800 megawatts from the nuclear source. He said Karachi nuclear power project K-II and K-III are at advance stages of completion. K-II will start its generation next year. Omer Ayub said that our nuclear safety standards are best in the world. He said the government is also making efforts to upgrade the distribution system. He said we are in negotiations with the world banks and the Asian Development Bank to upgrade the system of PESCO at a cost of five hundred million dollars. Minister for Petroleum Ghulam Sarwar Khan told the House that off-shore drilling has been started in the country by two international recognized companies. He said some good news is expected from drilling by the end of this month. He said oil and gas exploration is being expedited to meet the domestic requirements of the energy. Minister of State for Parliamentary Affairs Ali Muhammad Khan assured the House that nuclear power plants will also be built in Balochistan. He said Chashma-Nuclear power project Unit-V is being built at Mianwali. He said this project to be completed by 2026 will help produce 1100 megawatts of electricity. Minister for Law Farogh Naseem told the House that 1298 cases are under progress in the regional bureaus of National Accountability Bureau. He said these inquiries and investigation have been initiated under NAB ordinance on various charges of corruption and corrupt practices. 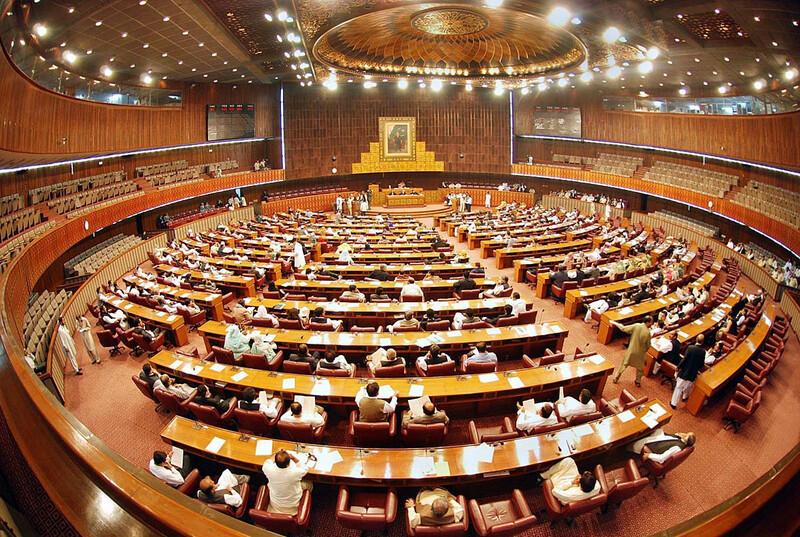 The House on Friday adopted a motion authorizing the Chairman Senate to make nomination of six members of the Upper House to the Parliamentary Committee on Kashmir. A motion to this effect was moved by Leader of the House Shibli Faraz. The Opposition staged a token walkout from the House over non-inclusion of name and picture of former Prime Minister Shaheed Benazir Bhutto in a government advertisement released on international women day. Leader of the House Shibli Faraz assured the House that he will look into the matter. He said there is no doubt on the contributions made by Shaheed Benazir Bhutto for the restoration of democracy in the country.